So our midwife Cassie had just arrived at the hospital. My family - mom, sister and dad - were there as well. 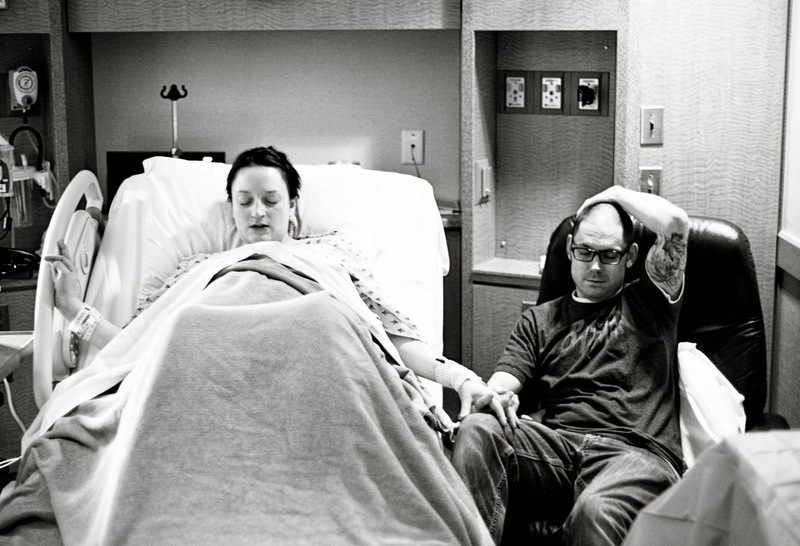 Cassie was one of the two certified nurse midwives we'd seen throughout our pregnancy via the Bozeman OB/GYN Clinic. (As a side note, we love them and would HIGHLY recommend them to anyone in the area.) So Cassie was a labor and delivery nurse for years at Bozeman Deaconess before pursuing her advanced midwife training. We loved her bedside manner and easy-going nature. Lori, the other midwife, was a military nurse for years and years. She had a more non-nonsense approach and tons of experience - she estimates she's delivered around 1,500(!) babies. 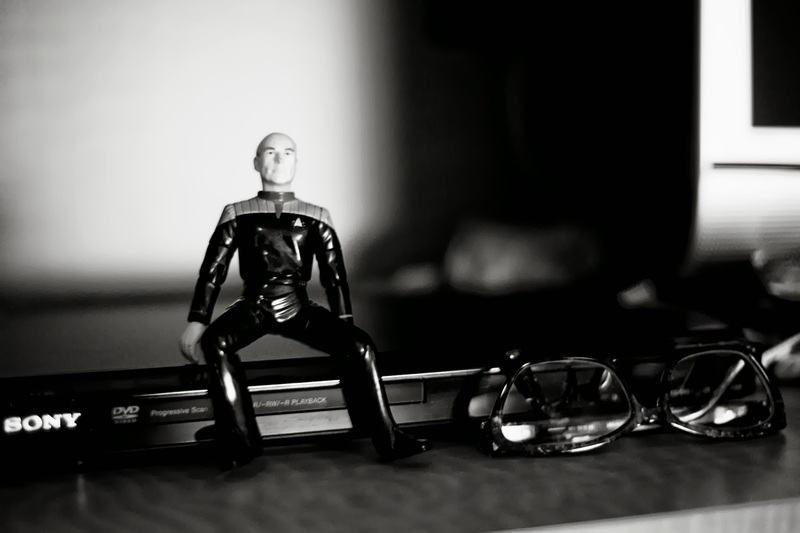 Captain Picard is my good luck charm so of course he accompanied us to the hospital. So when we got to the hospital Cassie was technically on-call, although she had really just finished her shift. She came in to check on me anyway. At this point I was in the jacuzzi tub that was in my hospital room. I didn't much care for the jacuzzi part but the tub part was wonderful. The nurse even came in with some drops of essential oil (lavender) to enhance the relaxation. After Cassie sat with me for a while, she let me know that it was actually her day off and she was going skiing with her family. Lori would be taking over from there. We had mainly seen Cassie for our pre-natal appointments so I was bummed she had to go. But I was confident that Lori would do a great job. The next few hours are kind of a blur to me (I'm pretty sure women have hormones that make them forget what giving birth is like so as to continue to propagate the species). I know that the contractions were hard. I wasn't getting a "rest period" in between each one, like I was supposed to. Instead I would go from like a 5 on the pain scale to a 10 and then back to a 5. Patrick and I had planned on taking walks, listening to the awesome birth playlist he made me, doing all of our contraction "positions" that we learned in our birth class (like slow dancing to said playlist). Unfortunately I just wasn't able to do any of that. Most of the time during these hours of contractions I was either 1. In the bath 2. Rocking on a birthing ball 3. In the bath tub with the shower running. I rarely laid down in bed, even though I was exhausted and really wanted to sleep, because it seemed to make the pain worse. Laboring on the ball under a shroud of warm blankets (best part of the hospital) while Patrick rubs my back. So I would labor for two or three hours and then Lori would check my progress. I was mostly just quiet I guess and I even remember Lori telling me at one point she couldn't even tell when I was having contractions because my facial expression didn't change at all. Lori, Patrick & the rest of my family were great throughout this period. They would just sit with me and help me through the contractions. Patrick would rub my back and try to help me get into the peaceful place we'd practiced so many times before. My family would take turns with Patrick holding my hand and sitting with me so he could get a break every once in a while. My sis holds my hand while I'm in the tub. The discouraging part was that despite how hard I was working and how hard my contractions were coming, I was not progress very fast. After two or three hours of intense laboring, I would get maybe 1 or 1.5 more centimeters. Lori said that sometimes it happens that way and usually at some point we would experience a "jump" and gain 3 or more very quickly. That never really happened. One of the few times I labored in bed. Poor Patrick didn't sleep at all either through the whole labor. I have no earthly idea what time it was, but at some point during that day Lori thought it would be a good idea to finish breaking my water. Because although my water had technically broken, the sac itself hadn't fully ruptured. Lori's thought was that if we broke the water, it would help encourage Grayson to move down and put more pressure on my cervix to get things going faster. Unfortunately this didn't work either. However I did get a second wind at some point after the waters broke and really felt like I could do it. I worked really hard through the contractions and spent another probably two or three hours alternating between the shower and the ball. I thought for sure when Lori checked me again, I would be at least at 8 cm. I was hoping for 9 cm. So when she said I was maybe at 7, it was really discouraging. The way I was progressing, that meant another 6-9 hours before I was even close to being ready to push. My amazing coach, keeping me going. At that point I had been laboring for probably around 18 hours or so. Another possible 10 hours before I could even begin the pushing process seemed unbearable. I hadn't slept in over 30 hours. I was exhausted, frustrated and discouraged. That was the point that my birth plan went out the window. Part of me wishes that I hadn't had any cervix checks performed. Maybe I would have had the strength to keep going if I didn't know how slowly I was progressing. But at that point I just really, really needed a break and to sleep for even five minutes. Lori suggested I have a small dose of some pain reliever that now I can't remember the name of. It would be administered into my IV port and would last around 45 minutes. Just long enough for me to get some sleep and maybe build up more strength for when I needed to push. So my resolve and pride out the window, I accepted the medical intervention.